Beginning in September 2015, Bishop Smith Catholic High School (BSCHS) in Pembroke will offer a hockey skills academy as a course option for grade 9 students. Based on the success of the program at St. Joseph’s Catholic High School in Renfrew, and with the support of Hockey Canada, 30 students will be accepted into the program for the fall semester. “We have received great feedback on the program from St. Joseph’s and this is something new we can add to the programs we offer our students,” says BSCHS Principal Clint Young. The official name given to the academy is Bishop Hockey. Team leaders hope that presentations to grade 8 and grade 7 feeder school students will result in a good mix of skill levels and gender in the program. Applicants will be selected based on the best fit for the program including fitness level and a commitment to both on- and off-ice components. “The hockey skills academy is not based on skill level. It is focused on individual development,” states Ryan Kranz, Head Administrator. Other program leaders include Tyson Holly, Head On-ice Instructor, Leslie Spencer-Hitchins, Head Off-ice Instructor, Tim Peplinskie, Instructor/Administrator, and Mike David, Instructor. 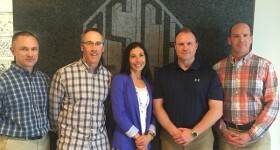 Holly will travel to Hockey Canada Head Office in Calgary in July for one week of instructor training that he will share with the leadership team. Each instructor will have the same opportunity in subsequent years of the five-year commitment to the program. “We have a great team—each member brings a different aspect to the program,” comments Kranz. The program will run on a two-week cycle during the first semester of the school year with three days on-ice in week one and two days off-ice in week two. Students will receive a total of 70 hours of ice time. The off-ice days will include hockey skill training such as stick handling, shooting, running, and yoga. Classroom work will include journal entry and goal setting. Overall, the program aims to “increase self-esteem academically and in athletics,” notes Kranz. As well as an emphasis on participation, assessment will include a final written exam and an interview during which participants will analyze the progress of their own skating skills on video using language taught during the course. While there may be scrimmages, games are not a part of the program. The fee is $350 per student to cover the cost of ice time and transportation from the school to Pem Ice II and back. An equity plan has been established and some financial support will be available for students who might require assistance to access the program. Participants will be responsible for bringing their own equipment, but will receive a Hockey Canada jersey and socks for on-ice sessions and two t-shirts and a pair of shorts for off-ice. While program leaders will provide the majority of instruction, peer helpers, volunteers from the community and guest speakers may also be incorporated. “It’s really exciting to offer this new, specialized program,” concludes Instructor Tim Peplinskie. Online applications to the program are being accepted until June 5. Photo: Bishop Hockey academy leadership team: Tim Peplinskie, Mike David, Leslie Spencer-Hitchins, Tyson Holly and Ryan Kranz.